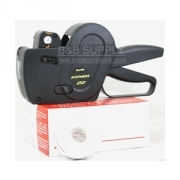 Price gun labels are extremely important in the retail world. However, they come with different qualities, shapes and colors and are backed by various brands. It's important to know if you're looking for pricing labels with space for 1, 2 or 3 lines of print. Is your price gun label going to be indoors, outdoors or in the freezer? Do you want custom price labels pre-printed with your company name? The general adhesive works very well for most common applications and has recently been improved. The improved formulation is now effective down to -10 degrees F. Most refrigerated coolers are not set to go below 20 degrees F, therefore, the general adhesive will work even with most cooler applications. The specialty freezer adhesive's range goes down to -20 degrees F. This adhesive is only effective if the label is applied on the product when is dry and non-frozen. It's very difficult to get anything to stick to water. The freezer adhesive has more grip and adheres better than the general adhesive in order to hold the label on better should crinkling occur. The removable adhesive pricing labels are used where the user would like to easily remove and possibly re-apply. A very common application example for this is in a gift shop. Often times the end consumer will want to remove the price of the item and the removable tag does not leave an adhesive residue. Another would be a product identification in a warehouse in which the label will need removed from the merchandise once it is sold. The permanent is the most aggressive option. It is often used in industrial settings where a product could be dirty. They don't get any sticker than this in our industry. If you feel your application will require a freezer, removable, or permanent price gun label, please call us and we'll go over your application and needs. All the labels sold on our website are general purpose adhesive.